We built two raised beds for gardening. We got soil from a local bulk soil company and filled up the beds. We planted vegetables and herbs, and while nothing has died, they seem to be living and not really growing. I had a couple of left over cabbage starts that I left in the container it came in, and they are nearly twice the size of the ones in the garden. Obviously, it's a soil problem. 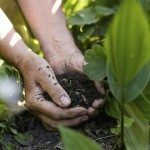 How can I amend the soil after planting? Side dress your beds with compost to help increase the fertility of your soil. When you put those beds down for the winter consider using a cover crop, any of the legumes are great nitrogen fixers and will certain help improve your soil for next year. Check with your local extension office for cover crops that do best in your area. Also get a soil test kit from them.